The scarecrow is a familiar sight in any farming community. So common, in fact, that locals don't even notice them, don't notice that they don't always seem to be in the same position, don't notice the stains of blood that sometimes appear on their clothes and tools. Sometimes they don't even notice that the crows hanging about seem well fed in spite of the fact that the crops haven't been touched. The Murder of Crows that accompanies many of the animated scarecrows will often attack any creature that the scarecrow engages. Treat the Murder of Crows as a 3 hit dice Insect Swarm with a moral of 8 as long as the scarecrow is active, and have it drop to 6 if the scarecrow is destroyed, and immediately roll a moral check. Tim from Gothridge Manor asked in my last post if I plan on posting my stocked dungeon. Yes, yes I do. Just as soon as I'm happy with it. I have been working on it, sort of. Actually I've been working on stocking random dungeons the last couple of days, just to get the knack of it again. I feel so rusty and out of practice, and as usual life keeps trying to distract me. I've also been reading or rereading every dungeon and megadungeon boxed set, adventure, book, article I can get my hands on. This goes back to my over prepping for everything. Last night I decided that my dungeon, my world will operate under the idea that bad things really do crawl out of the darkness. Vermin do spontaneously generate in the back of store rooms. 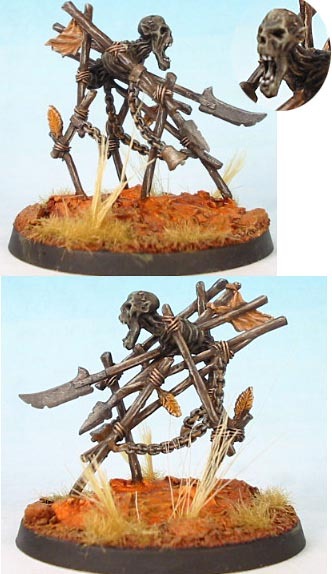 Undead arise naturally from abandoned graveyards and tombs. Goblins and kobolds spring from the dark woods and grottoes fully formed, fully evil, and ready to raid and destroy. Trolls form under bridges as a matter of course. 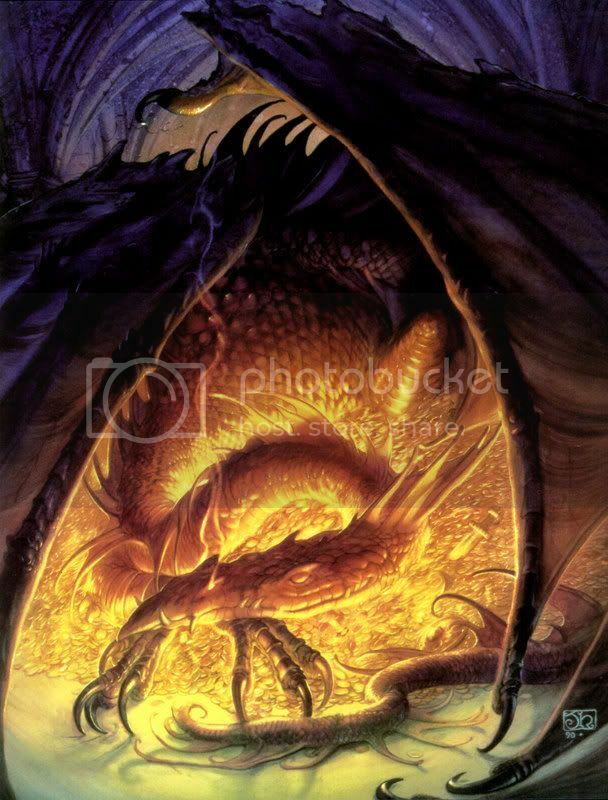 Dragons bubble to the surface from volcanoes and swamps to take wing and terrorize for miles around. Abandoned cities, villages, temples and dungeons (especially dungeons!) twist and the darkness consumes them, and what was once a logical structure more and more becomes a realm of nightmares. This will free me from having to make my megadungeon "make sense" as it currently exists, and is heavily lifted from the idea of the megadungeon as the mythic underworld as explained by Philotomy in his OD&D Musings. It also makes for a strong campaign that pits civilization against chaos. Over the weekend, I put my pencil to paper in an attempt to stock my dungeon and I didn't get very far. The problem was that I knew what this particular level had been used for hundreds of years ago, but I wasn't sure what had happened to it more recently. The rooms to the north of the main hall were the dwarven rooms for dignitaries and such. The rooms to the south of the main hall were for visitors to the dwarven realm. The main hall could be used for diplomatic ceremonies, but most of the time it served as a market for surface dwellers and the dwarves to set up stalls and sell stuff to one another. While it was constantly inhabited, the population rotated pretty frequently. I didn't want this level to be inhabited by a particular group, i.e. this isn't an orc hold, or a bandit lair. I want it to be a bit of a mix, probably with a fair population of vermin and a few undead. I'm going to have some orcs in the vault level, having just raided part of it, and they'll be coming out of the vault when the PC's arrive. What about the main hall? A big nasty thing? Or empty? I'm leaning toward empty, or at least devoid of monstrous threats, especially as the vault sub-level will have some tough encounters. Well, as I'm going for a semi-oldschool feel, lets roll for it. Using the tricks charts from OSRIC (pg 155-156) I came up with an antimagic alter. That kind of makes sense actually. You wouldn't want magic used during diplomatic negotiations! Lets go with that. Yesterday when I got home from work and let the dogs out in the back yard I looked up and saw crows flying from west to east. Lots of crows. For over 20 minutes. There were hundreds of them that I could see, maybe a couple of thousand over the entire period. I took a video of some of it - Crows over Baltimore. To be honest, it was kinda creepy. Yet at the same time I thought what a great mood setter for a game. How would players react to seeing a couple of thousand crows flying in one direction overhead? It isn't really anything they can directly interact with, but they're left with a choice - go where the crows are going, go where they came from, or ignore it. I've been thinking more about the structure of my megadungeon, and the implications that a central shaft driving down practically to the lowest levels of the dungeon. Players will be able to, from the start, descend the entire way down to the very depths of my as yet unnamed megadungeon. It'll be a very exposed descent, but they could theoretically do it. On the other hand, it'll be hard for a player to pass by all of the portals and doorways in between the surface and the lower levels! Monsters of the megadungeon. There will be a fair amount of vermin in the upper levels - lots of unintelligent critters. Kobolds will be pervasive throughout the upper levels, though never in great numbers. They've discovered that small tribes survive much better than large ones. They attract much less attention! Encounters with them will probably be with mining/scouting/salvage groups. They'll often be attracted to the sound of combat, yet not reveal themselves until after the fighting is over, and they can pick through whats left, and if the victors appear suitably weakened, then they'll attack. One thing I don't think I've ever done in all my years of gaming is to create random monster charts. I've used them, but I've never created my own. Now I'm going to have to create some for the unique ecology of my megadungeon! The way I figure it, the shaft is going to require it's own wandering monster table, possibly 2 of them, one for the upper half, one for a lower half. The first couple of levels from the surface can mostly all share a chart (with a few exceptions I expect). I continued to work on my dungeon this weekend. First up is the vault sublevel below the dwarven hall. Next up I've got a section of mine. I think this is from the abandoned hobgoblin area. You can see the finished room where the miners stay after their shift. Being hobgoblins I figure they probably used slaves to do the worst jobs. 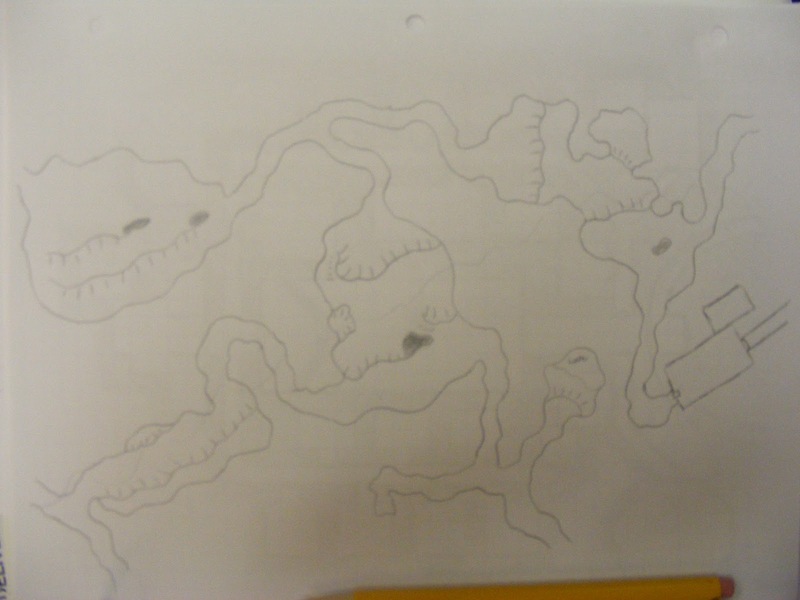 In the "How to Host a Dungeon" game that I played, the hobgoblins encountered the cave of fate, ending their existence. I haven't figured out what exactly that was yet, but there are a number of possibilities ranging from the mundane to the exotic. Luckily I don't have to settle on the answer now. I did this section on plain white paper, and it was pretty freeing getting away from the grid lines of graph paper. It's taking some time, but I think I'm getting back into the swing of map making. I'm liking my efforts more and more as keep drawing. I'm not sure where this is from originally, but I found it here. It's time I went to the carnival! 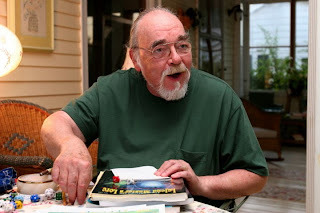 When I first started playing D&D it was entirely solo games with my friend Mike. Sometimes he would DM, but most of the time I'd DM. We never got too crazy, and I'm sure there were a fair number of mistakes that I made, but we had fun so it was all good. I don't know how to break out of this. Could it just be that I can't DM D&D for her? Should I try a different game? Am I just so out of practice, and so stuck in a certain style of gaming that I'm ruining gaming for her? Thursday night my wife and I played the free version of How to Host a Dungeon, and I kept a visual record of our dungeon as it evolved. Our little part of the world started with the Great Wyrm Ralph (whose name is nearly unpronounceable to dwarves was translated into dwarven and then into the common tongue of men, and means in the original dragon something akin to sleeping earth digger in a fancy sweater), a Cave of Fate, a random cave, a Cave of Gems, and a Disaster! The disaster ended up being an earthquake, which split the earth down near the bottom of the page and sent several tunnels reaching up toward the surface. The age of Dwarves arrived, and was relatively quiet. A vein of gold formed about halfway down the page, and the dwarves dug to reach it. Their civilization grew and eventually encountered Ralph, who took some of the dwarven gold in order to keep from eating them. Eventually the dwarves dug too deep... Actually they were well away from digging too deep, but the lack of interesting things caused us to speed up the end of their golden age. The end came in a fiery inferno from the earth. Volcanic fumes seeped through the rocks, ending the Age of Dwarves, and after a time the Age of Monsters arrived. A surface realm was founded, and a set of monsters moved into under-realm. A hobgoblin mining company moved into the western dwarven mine, and continued the work the dwarves were forced to abandon. Goblin breeders took over some dwarven barracks, and a xorn burrowed into the easternmost dwarven mine. The goblins were wiped out by ghosts lurking in the dwarven halls, while the hobgoblins mined too far and reached the cave of fate. Whatever it was they encountered caused them to disappear, leaving significant wealth in their caves. Ralph the Great Wyrm awoke from his slumber and attempted to take the treasure guarded by the ghosts. They scared him deeper into the dwarven halls. The xorn gathered treasure. A portent, the meaning of which would be argued for years to come, arrived in the guise of a fallen star. The surface civilization continued to grow, and a banished mage found his way down into ruins of the Dwarven City Greater Awesomeville. He was followed by an ogre who settled himself down at the bottom of the dwarven mining shaft. The mage while looking for magical treasure found the orge instead, and was squashed. A year later an evil cult moved into ruins of Greater Awesomeville. They also encountered the orge, formed an alliance, and set up a shrine in his cave. We rolled yet another happening, rather than something fun like wandering monsters, and this time got a disaster, and we rolled another earthquake. We decided another earthquake would be boring, so added some wandering monsters. Slimey giant slugs moved in near the xorn. It turns out that slug meat isn't very tasty. While the slug died, it did give the xorn indigestion (a tie). The surface dwellers, having finally equipped their kingdom with appropriate farms (giant venus flytraps, bear ranch, flying hamster aviary) sent an explorer group into the dwarven tunnels. They didn't encounter anyone of note, but did find a whole bunch of dwarven loot, and they then attracted a wizard of some note, and built him a tower near the volcano and meteor crater. The Age of Monsters is about to come to an end. The surface dwellers have 5 treasures, and are likely to get another if they can survive the ghosts! Buy by this point we'd been playing for about 2 hours, and were both ready for bed. While we haven't finished the game I think we both enjoyed it. Our priorities were different. I was looking for a good naturally developed dungeon ecosystem, and maybe even a back story for the megadungeon. Virginia's priorities leaned more toward having a fun excuse to draw things like worms in sweaters, flying hamsters, and dwarven ghosts! All in all I think this is a really fun game, and 'd love to have a computer program that would do the rolling and In the future I'd like to have smaller tokens. Coins were the only thing I had on hand, but even using legal sized paper it was getting really crowded by the end. I also found myself hunting around for the encounter rules. They are listed on page 8 under the heading "Monster Groups", while I would have found "Encounters" a better heading. Old School? New School? It's all cool! 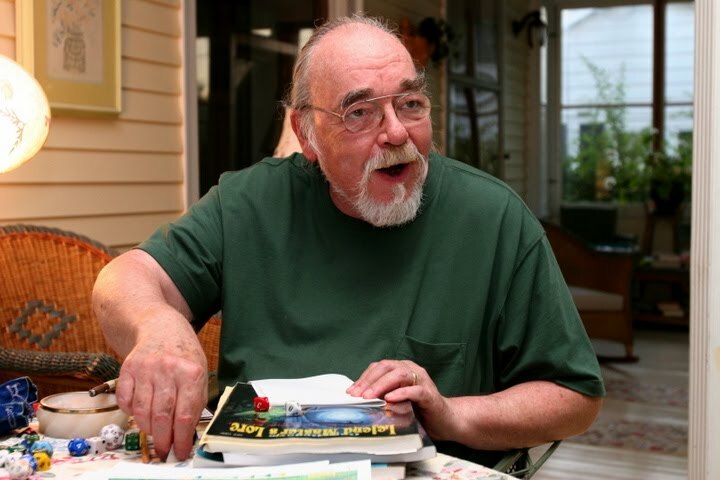 I started playing D&D with the Rules Cyclopedia, and loved it. I moved onto AD&D 2nd Edition when I got to high school in the mid 90s. When the players option books came out I used them too. I was working in a comic/game shop when 3rd edition was announced, and I was thrilled. I hadn't really been playing any D&D since I got to college, both because it was a really small school, and my games had become pretty bloated from all the books that had become "necessary" to play 2nd Edition, so I thought this would be a great way to get back into things. As soon as the players handbook came out I started a group. I continued to play until about a year or so after 3.5 came out. A whole bunch of real life crap happened, I got into Warhammer 40K and Lord of the Rings SBG, and role playing just fell to the side. Then 4e was announced. I was apathetic about it. I wasn't playing, and I had plenty of 3.x books, and my Rules Cyclopedia. Who needed more? Anyway, as my previous entry showed I don't think there needs to be any sort of division between us gamers. Be you an old school grognard or a new school gamer there is plenty of room for everyone and for all ideas. What does this mean for me? It means I get to read all sorts of cool stuff that people come up with. It means that I can the best ideas and try to apply them across the board. Of course I don't have an active gaming group right now, but I'm hoping. And while I'm hoping, I'm reading and assimilating ideas and getting ready to game. If someone offered me a chance to play right now, be it OD&D, a retro-clone, M20, T20, D20, or 4e I'd be there! If it was 2nd edition... Hell, I'd play that too, though I'd need to get the books again for that one. Whatever you're game of choice, go play! In combat the Gallowsgaunt will lash out into it's victim with it's wooden limbs, chains, and ropes. Anyone attacked by the Gallowsgaunt must save vs paralyzation or flee at top speed from the monster for 1d6 rounds. At the end of the d6 rounds the character will have immunity from this fear effect for 24 hours. Due to the nature of the reanimation, turn attempts made against a Gallowsgaunt are made as if it is a 6 hit die creature. I haven't finished painting my gallowsgaunt yet. This picture is from Cool Mini or Not. 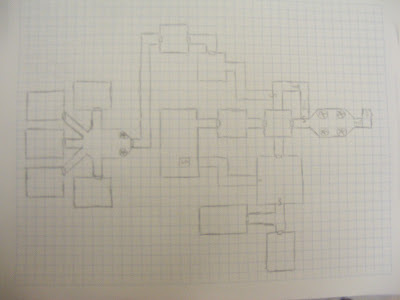 Yesterday I pulled out some graph paper and stared sketching out what I thought would be the first level of the dungeon. I had spent some time looking at maps other had posted, at random map generators, and put pencil to paper. I enjoyed it, and I think I came up with an interesting dungeon, but it was just... too random. I wanted there to be more story behind the dungeon, not just... a crazy hole in the ground. So while cooking dinner I thought about what this megadungeon was built for. I decided that it was originally built for the reason I imagine most dungeons are built for, storage under a castle or other fortress. Now what sort of things would a castle store? Thinking about what sort of things I store in my basement I realized a castle would probably be just like that, only more so. There is food storage of course, but also stuff storage. Imagine after a couple of hundred years how much junk might accumulate in someones huge basement. Things like seasonal decorations, old tools, broken items of furniture, grandma's plates and bowls with the really ugly pattern, the stinky stuffed owlbear wearing wizard robes and holding a decorative wand, and even more would be kept down in the basement. There are probably treasures mixed in somewhere, or at least there were before mold or monster (or monstrous mold) got to them. The first level of the dungeon would be for bulk storage. Things that would be too large or too heavy to want to move too far from the main castle. The next level would most likely include smaller stuff, and prisoners. You don't want those screams echoing up into the castle now do you? There are probably areas where the garrison can fall back to should the castle be taken, and crypts. The crypts can be pretty extensive, extending down and out for quite a ways. Further below that are the vaults, and the most heavily trapped area of the dungeon. This is how the dungeon was originally built, many many years before. 150 years before now the castle fell, and the area became wild as civilization was driven out. The ruins of the castle were raided, and the dungeon plundered and inhabited. Over the last 150 year it's inhabitants have expanded and remodeled the dungeon. Recently a trade route reopened nearby, and stories of the fallen castle and it's vaults have begun to spread. 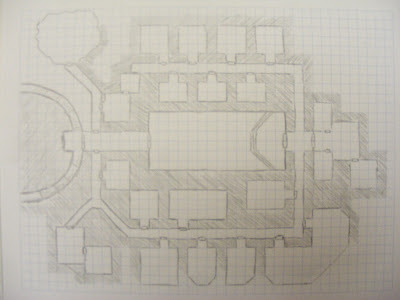 So after dinner out came a fresh sheet of paper, and I basically drew large warehouse style rooms, pretty boring by themselves, but I intend to fill them with both the stuff from the castle (what's left anyway) and a humanoid clan and a human bandit gang that has set up shot to raid the trade road. I figure the bandits and the humanoids have come to some understanding about the only exit to the surface from this level and they keep themselves segregated. Members of both the goblin band and the human gang will be out of the dungeon and will return after the heroes have passed through the first time, or while the heroes are in there if they decide to camp out in the dungeon. There is a hole down to the 3rd or 4th level (I haven't decided), and stairs to the 2nd level. The second level will have some undead, as well as critters, and more humanoids. From the second level there will be access to the first level, and the 3rd level via stairs. There will also be access to the 3rd level via holes dug in an attempt to avoid the traps and get into the vaults. Sections of the 2nd level will be cut off due to collapsed corridors. These sections may or may not be accessible from the 3rd level. The crypt section of the dungeon may be accessible from the surface. Might be blocked off though. The third level will have lots of undead, as many have died trying to get into the vaults. I also figure that a wizards workshop will be down here, which can include all sorts of fun things. The wizards workshop can delve deep into weirder sections. There will be further additions to the dungeon on this level by kobolds or other diggers. The levels below the 3rd will include natural caverns which will connect with some dwarven/kobold mines. There will also be a hidden escape route from the 3rd level to an as yet undiscovered location on the surface. Lately I've been painting Lord of the Rings minis, but this past weekend I really wanted to do something different, something that was monstrous, something that jived with my increasing anticipation for Halloween. Years ago I picked up a couple of Ral Partha pumpkin 'eads, scarecrows, and a greater pumpkin 'ead just because they were cool. I also have a Gallowsgaunt from the Chainmail line, which fits the theme pretty well too. Monday night I pulled them out of the cabinet of minis I've yet to work on, and started to work on them! Once I had them out and on my painting tray I was further inspired to write up stats and descriptions for them for D&D. Which D&D? BECMI, M20, and 4e. Thats right! 3 different sets of stats! The figures are assembled and based, and I've started to prime them. Painting them up shouldn't take too much time, as they are all pretty simple minis, and once I've got them done I'll start posting the stats that I'm writing up along with the pictures of the finished minis. While shopping yard sales this summer for a gaming/craft table I came across this. It was only $1, and it came with what I think are the original dice and crayon. My wonderfully tolerant partner Virginia looked at me incredulously and asked me if I seriously wanted it as I snatched it from the table. I replied "Oh yes!" and and refused to put it down until I had paid for it. I've been reading it, and I'm struck by how different it is from 4e, and yet how familiar. That makes sense as I started with the Rules Cyclopedia, which is pretty much the BECMI rules sets in one book. The assumptions built in to the game, the old school feel of it if you will, certainly brings a smile to my face. I'm tempted to try running this at some point, just a one shot, going through the intro adventure. My first mega dungeon was drawn out over... 6 newspaper sized sheets when i was about 11 years old and playing Rules Cyclopedia D&D. I don't think I ever ran it, though I did spend a fair amount of time stocking it! It was probably one of the most random assortment of monsters ever put to paper. As much as I enjoyed doing it, I was always dissatisfied with it, though at the time I didn't know why. It was almost a decade later when I returned to a mega dungeon. This time it was Undermountan and my adventuring party only dipped their toes into the vast halls. This was the last time I ever messed around with a megadungeon, and I haven't really missed it. Minidungeons (a word I first heard over at taichara's blog) were much more my style, even if I didn't have a snazzy word for them. They just made more sense to me than the huge sprawling complexes with everything plus the kitchen sink (mimic) thrown in. How would that work?!? Why are there gnolls next to a necromancer, next to a goblin clan, next to human bandits? And why are there human bandits so deep in the dungeon? Who are they raiding anyway? 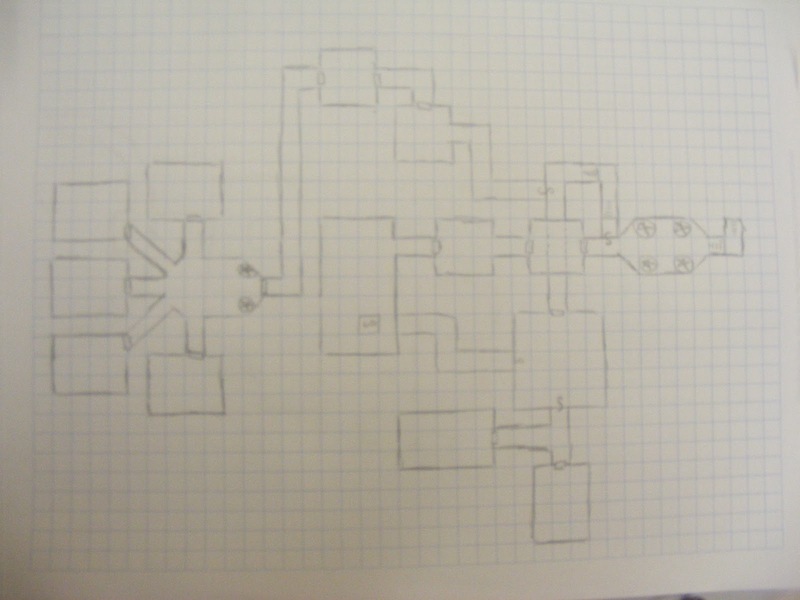 For the past couple of months the idea of a giant dungeon complex keeps poking itself into my consciousness. Sending a group down into it's depths, not to see the light of the sun for weeks or even months... 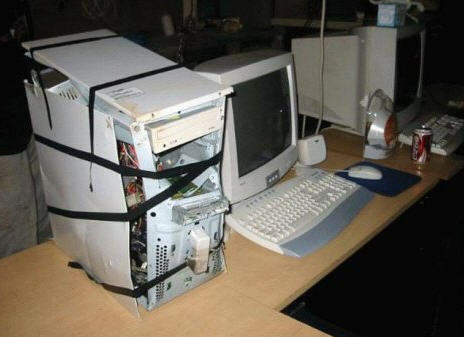 But how to make it work? How do you make a megadungeon make sense? The answer I arrived at is this - A megadungeon isn't just a big dungeon, it's a huge one, sprawling over vast amounts of space. Sprawling is the key. A megadungeon is nothing but a series of interconnected minidungeons! There will be miles of tunnels with little to nothing in them, areas that started to be excavated but were abandoned before they got more than a room or two deep, lots of areas that would qualify as a minidungeon, and a few larger complexes that would take up a page or 3 of graph paper. Why? Easy, why build something if there aren't any resources nearby? Areas that are dug out are dug out for a reason, and that reason usually will have to do with resources; water, minerals, lay lines, etc. and whatever resource is nearby will influence the construction of the surrounding complex. Exits to the surface or to lower levels, or areas where multiple sections naturally come together will be busier and have more variety of encounters. Areas without any resources will be empty. Why are there lots of long tunnels connecting all these mini dungeons? Well, there are lots of large burrowing creatures out there, and lots of natural caves, and people want to get from place to place in order to exchange things... plus with thousands to millions of years of underground empires, it's logical to presume that various avenues would have been created. Trollsmyth over on taichara's blog had the word "wayedge" as his word verification for a comment. It sounded like a cool name, so they decided to individually make a magic item with the name Wayedge. The name caught my imagination too, so here is my take on Wayedge. Jie Chue, master forger of the ancient empire, long ago crafted a small blade for a patron who's name has passed into the sands of history. Tales of the blade, however, have turned up from time to time. An elven assassin once used Wayedge to slay a noble baron, which spurred the baron's daughter to take up his sword while his son took up the crown. It is also told that Wayedge brought low the Goblin King of Thunder Rift in the hands of a courageous halfling. It is not known where Wayedge currently rests, but it never stays out of bardic tales for long. Wayedge is a single edged shortsword with a gently curved blade. It's hilt is a flowing brass knot-work design that begins at the cross-guard and finished at the pommel. It is preternaturally sharp and polished without ever needing to be tended. Wayedge is enchanted as a +2 shortsword with two unusual enchantments. The first allows it to be thrown as a dagger. The second manifests itself rarely, only when it has been thrown as a dagger and the player rolls a natural 20 on their attack. When this happens the character who threw Wayedge will be instantly teleported next to the target and able to make a second attack without penalty. In 4th edition terms as an at-will interrupt ability on a critical hit when thrown, Wayedge allows the owner to teleport adjacent to the target and make a second basic attack after the teleport. In the dusty halls of this blog I plan on posting whatever random gaming thoughts I happen to have at the time. They will likely range across a variety of systems, though most will probably be related to various editions of D&D. I also have a livejournal account where I tend to post more about what's going on in my life, and far fewer of my gaming thoughts. As for my role playing gaming history, it stretches back almost 2 decades at this point! I've played D&D, Star Wars (d6 and d20), old World of Darkness, Alternity, Nobilis, and I've flirted to various extents with a number of other games and systems. I'm also a miniature gamer, mostly focusing on Games Workshop's Lord of the Rings game, as well as Warhammer 40K. I have a cabinet of unpainted minis and am trying to work through it before buying more. In real life I have a beautiful wife, and together we have a pair of corgis, a hamster, a guinea pig, 2 foster guinea pigs, and some fish that we keep in our colonial style house just outside of Baltimore.